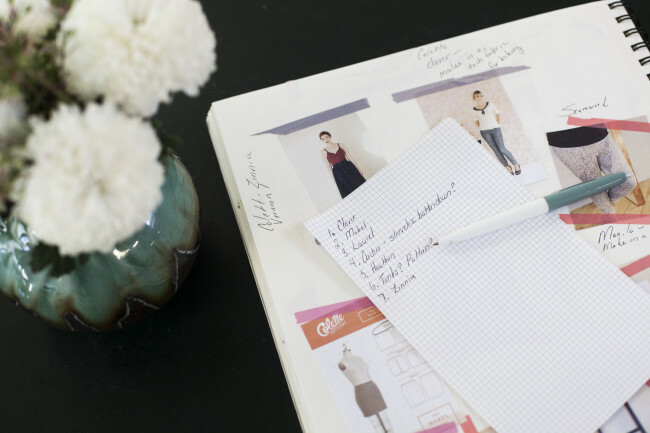 Now that you’ve done the messy work of cleaning out your closet, we’re going to spend March identifying the holes in your capsule wardrobe and planning sewing projects. In the meantime, if you absolutely know you need a new pair of pants because you finally donated the pair that you wore all the time even though they made you unhappy, don’t be afraid to get a jumpstart on sewing. There are some things you’ll just know you’re missing without making lists and completing exercises. To get started, review Wardrobe Architect: Week 11 and start with shopping your closet and finding the holes. If you plan to purchase some new items now is the time to decide what they are! Maybe making a new coat or pants just isn’t in the cards for you this year, or perhaps you want to focus on new challenges and just want to buy the simple items on your list like t-shirts. Make a list of what you want to buy and keep it with you so that you can easily consult it next time you’re in a store. After you made your shopping list, let’s pair up the remaining garments you listed with some of the patterns you picked in January I used Polyvore to help me bring it all together. I found easy matches for most of the garments on my list, though my original set of patterns did not include any sleeveless button downs, woven tees, or knit tanks, so I may draft those patterns myself, or search for some additional patterns. I also noted that a few of my originally selected patterns were sadly left without a match. That doesn’t mean I will never make those garments, but this exercise has shown me they’re a bit lower in priority in my sewing queue than other patterns. Now it’s time to figure out what you want to sew and when! Plan your queue through at least July, which is when we will get another chance to take a look at our queues. Here in Portland we’re already seeing the first signs of spring! That means all of those remaining cold weather garments in my sewing queue such as jackets and leggings, are quietly being traded out for pretty spring dresses. Seasonality varies so much worldwide; if you are south of the equator summer may be winding down, and if you live in a coastal region what you wear may not change much throughout the year. Whether summer or winter feels months away, or just right around the corner, make sure your sewing queue reflects that! We’re in flux here in Portland, so I’m focusing on transitional pieces before I segue into summer, but you may still have a few months of winter to get through! So which item made it to the top of your sewing queue? And what new garment are you most excited to make yourself this year? My top priority is black pants, but I’m most excited about making a blazer! One of the garments I’m most excited to make is a simple black halter top using a 1970’s vintage pattern (Simplicity 1365). I love halters, but it’s actually really hard to find an OTR version that’s structured enough for my taste and body type (larger bust, need some support!). I have several flowing, summery skirts that will pair perfectly with it. In San Francisco, the weather’s so unpredictable that I pretty much have a halter top and peacoat in rotation all year long. I lived in San Francisco for about 6 years, and you are absolutely correct! Most of the year I was able to wear the exact same thing, but just swapped out heavier coats for lighter jackets. In San Francisco even on the sunniest, most beautiful summer day you still need a jacket by the time the 4 pm fog starts to roll in. It is Autumn here now but still very warm so I have moved on to make my first full couture dress for winter. It is just cool enough at night to handle the fabric and I am getting ready to settle into the main part of the year in which I sew. Sewing in summer doesn’t really work in this part of the world (at least for me) because it is too hot and I want to be outside then. After my dress I am making a tailored jacket for winter which I plan to wear with a boned dress made in a wool check. I’m still new to this capsule wardrobe idea. I’m quite unhappy with most all of my wardrobe, instead of just trying to fill holes. How do I figure out how many and what types of clothes would make a good capsule wardrobe? I’m a little lost on how to decide I need X pants and Y shirts, if you know what I mean. 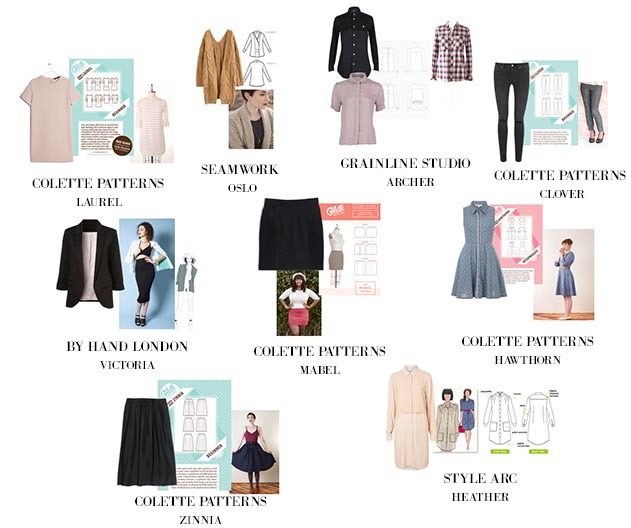 I’ve discovered a list of patterns that fit my silhouette goals per the January tasks. However, I want a well balanced closet, I could have gaps or too many of one kind or items that don’t really fit together even though on their own I like them. Do you have any tips? Or links to articles that would help? Or a good skeleton wardrobe idea/list to build off of? Or is there a good article from the 2014 wardrobe architect challenge? Thank you! Thank you so much for the blog link, I also have no idea what pieces I need to create a cohesive wardrobe (I’m stuck in a blue jeans and top rut). This blog is really helpful – I now feel able to look at my wardrobe and start building a list of what I need! Ohhh, thank you! I had seen this blog awhile ago but couldn’t find it again! Thanks so much for sharing the link, I hadn’t heard about the site before and I think it’s a great companion for the Wardrobe Architect, but with ‘sew’ instead of ‘buy’. I must admit that I found the ‘finding your style’ part of the challenge very interesting, but a bit hard to engage with, as I realised I actually know my style quite well, what I like and what suits me well. What I actually need is to streamline my existing wardrobe, which is huge, stop buying new things and sew items that fit in with what I have, my capsule wardrobe. So I will now not feel guilty about putting stuff in boxes for later instead of getting rid of them and rotating more. Good luck all with your personal challenges! I am in exactly the same position as you. During 2014 I did a number of online sewing courses and have made five summer dresses, mainly to just test the patterns. Aside from those there isn’t anything in my wardrobe that isn’t ancient (threadbare). We are going into Autumn so I am concentrating on Autumn/winter. I will carry on ‘making do’ with what I have for summer. I think what I will do is visualise what I need to wear in a week, the work/ home/exercise/socialise balance and go from there. I read a while ago that two jackets, three skirts or trousers, four blouses or tops, two sweaters and one dress would give you many combinations. I have difficulty deciding what colours & fabrics to choose, but I think that’s another story. I think I will try dresses (easy to make), skirts & trousers with several tops (easy patterns initially like the shell tops) and maybe a jacket to go with all of them. Thank you for making your post, I was beginning to think I was the only one on Planet Earth who had this problem. I’d start at post 1 of the 2014 Wardrobe Architect series and just methodically work your way through the exercises. It’s very helpful! I admire all of you ladies that are going to be good and sew up the necessities first. I’m going to start with the stuff I’m most excited about. Mostly lingerie because I am in dire need of it and it’s a new skill I get to practice, plus it’s pretty. I’ll invest money instead of time in some of the boring stuff. I’m working on black pants as well! It’s a pretty desperate need as I swap out the other trousers I’m not in love with but still need work-appropriate pieces. I’m sewing quickly to fill in the gaps! leave for a weekend trip to florida in two weeks – dd is in the md match – and have to be able to dress for a special occasion, but be able to layer and walk. the tana lawn is going to be the first project off the list. the graduation trip to the keys in may is the deadline for the tank tops – and i just added aberdeen to the list – and cropped black pants, and i hope i can fit in the kimono and a pair of shorts. i have a picture of what i want – they’re fitted at the waist, with pockets, but the legs are loose and rolled up with a side tab, not too short – but i’ve yet to find the right pattern. i’m way past short-shorts. I have a constant need for new t-shirts. I think babysitting a 1-year-old 2 days a week is having a terrible effect on my wardrobe!! I love to read what everyone has written and I love this blog. I just found some great petterns I want to try. I am still needing patterns for long cardigans. Maybe I just should buy few and not sew. I am starting with few very simple things, like t-shirts and skirts. I am half way making a blouse and just finishing a nice t-shirt. I am going to do that match making thingie and figure out what to wear with what. Life happens and I am a step behind. So, I will be making a dress first, however I need a slip to make it look fantastic and they don’t sell simple full slips anymore – but there is the lovely Cinnamon. I have a pattern with tops in several views. I really need tops next. This is fun. Thanks again for doing this. It is very inspiring when the season changes and the weather warms up. I have started thinking about my new season wardrobe too and have made a few dresses. Thank you for this post , I think it will save money if I seriously plan what I need. Sometimes though it’s a matter of want, when I have just got to have it!! Hello! 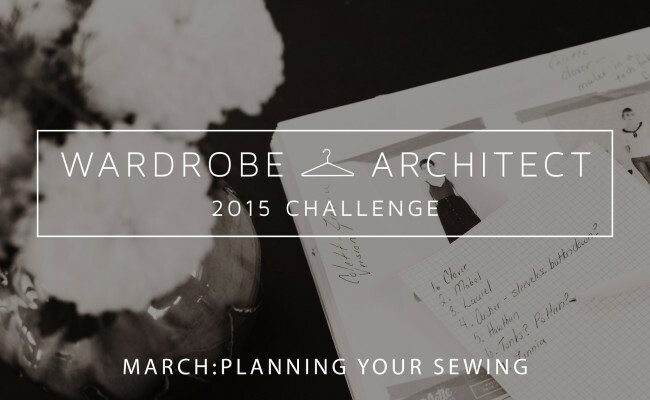 I am a bit late to the party but so need this challenge to sort out my clothes and life! I have only been sewing since last September but are already getting quite a collection going and I’m definitely falling into the trap of just jumping from one project to the next with no planning or thinking about it fitting into my style etc. For me, good clothes give me confidence and that is all I want in my wardrobe now so thankyou for starting this and getting me excited about streamlining my closet and planning my projects. And will keep in touch with further progress! Good luck to all you lovely architects out there! I’m most in need of leggings, so I’ll make those soon. I’m most excited about my knitwear and I just finished a 6 week long wool cardigan tonight. yay! No sign of spring here in Ottawa, Canada. It’s nice to plan and get inspired by others though. Thanks Kristen for the useful post! I’m looking forward to start planning more seriously my wardrobe. Tops, tops, tops! They are my priority by far. Button shirts as well as long-sleeved tees are on my sewing list. I also bravely went into my fabric store and bought some knit fabrics for the first time, to make tees and sweaters. The patterns I ordered for these are arriving in my letterbox this week. I’m really excited about making a cosy warm sweater in the fabric I bought which is a midnight blue with black flower-design against it, as autumn is arriving where I live. Also, I bought a jacket pattern which I’ll either make this year or next. I’m needing a jacket that looks a bit dressy – fitted with a zip-front. It’s great to sort out the wardrobe gaps as it makes thinking about the what and how of sewing (or buying) so much simpler. Thanks for the help. My plan is ready: http://punktyodniesienia.blogspot.com/2015/03/wachallange2015-4-sewing-plan.html! Last month I sewed first two pieces of my new wardrobe: a breton slim-fitting top and a half circle denim skirt. This set became a great inspiration for me. Now I can’t wait my next half circle red skirt. I’ve never sewn a blazer before, so this is my big question-mark. If I can do it? If I have enough sewing skills and patience? So fingers crossed! I am finally adding my post here! I’m glad to be joining in, even if it is on a smaller scale. It would help if I included the link!